You have an important guest and bring out your best, but rarely-used teapot. You go to pour the tea, then you remember that the spout isn't very good. The tea dribbles down the spout and onto the tablecloth. You think that pouring slowly or fast might be a problem, and go for a middle speed - but that's the worst. The only fix (other than a new teapot) is a blob of butter on the spout. For coffee lovers, the Barista Effect is also discussed. In the graphics, the gray triangle represents the tip of a spout, with various internal/external angles selected by the Lip Shape buttons. The blue line is a thin layer of liquid flowing on the surface, with the ideal case being that it falls vertically from the tip of the spout. The amusing name of Teapot Effect goes with some important science. The effect is relevant to everyone who pours liquids. The analysis is based on a brilliant paper by Kistler & Scriven, The teapot effect: sheet-forming flows with deflection, wetting and hysteresis, J. Fluid Mechanics, 263, 19-62, 1994 which overturned many of the previous theories for the effect. Pour more slowly (sometimes works, sometimes fails - why?). Pour more quickly (sometimes works, sometimes fails - why?). Change the surface tension of the tea (not usually a good idea, but if you have to, then increase it). Change the surface energy of the teapot spout (a sure-fire winner; reduce it with a dab of butter). Redesign the spout so it has very steep angles and sharp cutback (a sure-fire winner, but not to be attempted unless you are an expert in remodelling teapot spouts). Although it sounds amusing and trivial, the teapot effect may not be so funny if you are pouring liquids other than tea, and is rather subtle and complex. There are two effects going on at the same time. The pure hydrodynamic effect has nothing to do with surface tension. If you set ‘wettability’ to low you’ll see this effect. At high and low speeds of flow, the deflection of the liquid from its expected path is moderate. At high speeds this is because the inertia of the liquid overwhelms all other effects. At low speeds this is because gravity pulls the liquid straight down, overwhelming other effects. In the middle you get the maximum deflection. Where does it come from? The answer is that there’s no simple answer! The liquid flowing down the spout has a slow-moving part (near the walls) and a fast-moving part (at the surface). Just after the spout the flow must be uniform. The ‘pure hydrodynamic’ teapot effect arises with this sudden change in speeds (and, therefore, angular momentum) of various parts of the liquid. The reason there’s no simple answer is that about 5 factors are intertwined in determining which way the liquid should flow. It’s impossible to say that one factor is controlling it. You can be confident in saying that the effect arises because of the change in speeds across the liquid. After that all bets are off. The steeper the angle of the spout, the less the effect. In real teapots, the spout doesn’t have sharp angles, so the point where the flows change is not as well defined as what you can see on the screen. However, if you play with a variety of teapots you will see the trends are in the same direction - the sharper the angle of the spout, the less the effect. The second component comes in when the liquid wets the surface. It then has a chance to turn the corner of the spout and flow along it for quite a distance. A badly designed spout with a flat edge is guaranteed to deposit tea on your tablecloth. Change the wettability from low to high in the animation and you’ll see the effect. The fix for this problem is to make the surface unwettable. This is done either by increasing the surface tension of the liquid or decreasing the surface energy of the spout. The latter is much easier and a dab of butter (or anything greasy that comes to hand) is an instant cure. The effect of the butter is as dramatic as that shown in the animation when you click on low wetability. A barista watching an espresso being produced can tell when the coffee coming out of the spout contains fewer flavour componds - it starts to curve underneath the spout having at first fallen straighter. I've had great difficulty explaining this because a low surface tension gives more wetting to a surface, so on a pure "wetting" explanation, the effect should be the other way. Having a lower wetability spout (the blob of butter) is scientifically the same as having a higher surface tension liquid. I got so confused while trying to write about the Barista Effect that I spent some time at the kitchen sink with various jugs and teapots with some tap water and water plus dishwashing liquid - and, of course, some butter. The butter worked as it should - the water (even with detergent) forms as a non-wetting drop, and there is very little curvature beneath the spouts. The water with the dishwashing liquid clearly wets all the surfaces much better - flowing out rather than forming a distinct drop. But the pure water always wrapped more around the spout than the detergent water. So the explanation must lie in the complex balance of flows described in the paper, where a "stronger" surface allows the flow to keep going in a straighter line. 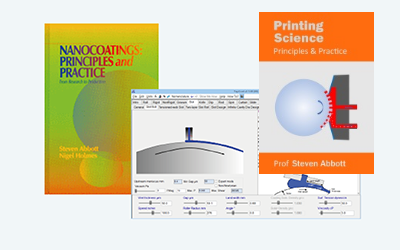 The code for the app is translated from the code I wrote for the TopCoat package of coating science (see the link below) and is used with kind permission of RheoLogic Ltd.